A very pretty, silk organza dress featuring a frill around the neck which dips to a V at the back and a generous petticoat. Available in ivory and white. Choose from either organza or silk dupion sash. 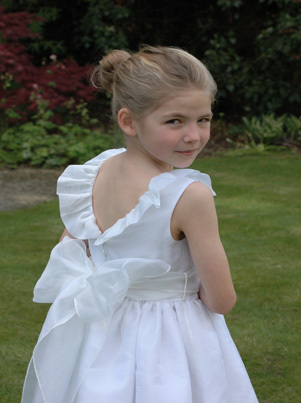 Available in four organza colours and a wide choice of sash colours, view the full colour range here.